The mystery could make the journey exciting if we’d just trust God and not worry so much. Thanks for this reminder. Blessings to you. So good to be reading you here this am!! HE and HE alone is our security. That allows us to walk forward not knowing all the details. I’m a planner, so I like to have a road map of what’s up ahead, but God promises to walk with me, but it will be at His pace and one step at a time. This draws me into utter dependence upon Him. Awesome reminders here! What a great encouragement to move forward, to press in, to let go of control! Sometimes we hold our dreams so tight we forget that it isn’t about the dream as much as it is about our relationship with God. He wants us to press in to Him. That’s the goal. That’s the heart of it. Keep pressing in, keep going, keep letting go! Becky, I am so glad you went right to the crux of it all – it is all about relationship with Him. May we grow more deeply in our walk with Him, for He will always be there with us as we move forward. Always, whether we see it in this moment or not. We can trust His timing. Hi, Joanne! So glad to see you here. Whenever I feel bad for questioning, wondering, doubting my dream, I recall Moses response to God’s calling. This heritage hero had some serious issues, just like us. But, God … Thank you for this affirmation and encouragement. Blessings! Alice, I so agree with you. Not only did Moses question but he had more excuses and debated them with God. I am so grateful we can discuss our doubts and questions with God. He patiently deals with us and moves us forward in His purposes, in spite of ourselves. Thank you for sharing and encouraging me this morning! This business of bowing to the omniscience of God and saying “yes” when we see only a cloudy image of what’s ahead . . . always a challenge for this planner and clinger to the known. I can’t imagine Moses EVER saying yes to God if that burning bush had given him a panoramic view of 40 years in a howling wasteland with his grumbling cohort, and yet that was Moses’s path to blessing. So often my path to blessing has come through a completely unexpected path, and so we keep on learning and trusting. Joanne, I’m thankful for your wisdom and beautiful words. Michele, I love your insight! No one would have said yes to 40 years of hearing complaints! It’s always the unexpected path He leads us on that is paved with future blessing. Yesterday as I sat in church, one line in the Scriptures read stood out like a neon sign –> “So I run with purpose in every step” (1 Corinthians 9:26a, NLT). There is purpose in each and every step. Joanne, I love your final statement- keep, moving, wait patiently, and our dreams will come to be RIGHT ON TIME! I tend to become impatient often. It is a good reminder for me, that God’s timing is ALWAYS perfect! Such wonderful encouragement on this Monday morning. No matter what unknowns lie ahead, we are known intimately by God and He goes before us.That brings courage! Such good insight, Tiffany. Our unknowns are always known to Him! Thank you! Such wonderful encouragement today. The idea that God reveals pieces of our dream to deepen our relationship with him is so true. We desire to see the whole picture but God knows what we need and when we need it. The words from Habakkuk really spike to me today. It is so true, Mary. It is a good thing we don’t see the entire picture all at once. We would really struggle with fear. God truly knows best how to move us forward! I’ve never thought of it this way before, Joanne! Our time of dreaming is meant to draw us into a closer relationship with God. What a beautiful thought for my evening :). 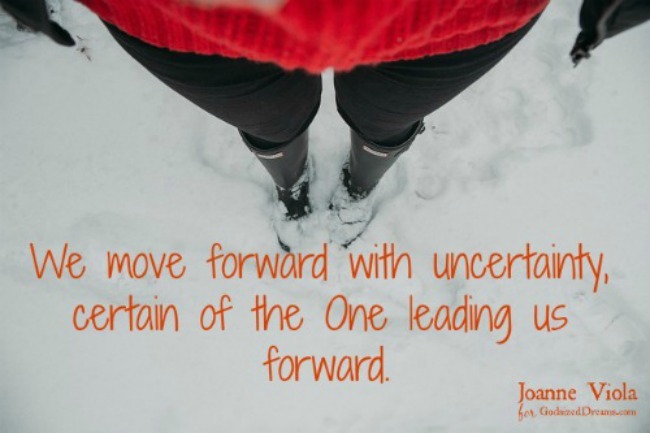 Thank you for the reminder that we can move forward with uncertainty because our certainty is in God who leads us forward. It is amazing how it makes us calmer about not knowing the “where” when we know the Who. Your words spoke to my heart. I felt so comforted in the knowledge that God will bring the dreams in our hearts to pass as we trust in His timing and the management of the details. The patience to wait on Him and to continue to abide in Him, will bring me more satisfaction and peace on this journey. I especially enjoyed the verse in Habakkuk 2:33 and feel it will sustain me as I wait on His leading. I am so grateful the verse from Habakkuk spoke to your heart. I am always encouraged when I read Habakkuk. And thank you for encouraging me today as I questioned myself in writing this post. Blessings! Joanne, your writing is always good. And, that Habakkuk scripture? One of my absolute favorites! It has been one of my favorites for years. It always brings me back to the point of waiting on Him.